Ciliated cells on the surface of frog embryos, with cilia highlighted in red. From research published in March by Brian Mitchell, PhD. The medley of Feinberg research published in 2018 exemplifies what has been a banner year for discovery at the medical school. From fundamental new understandings of the cell published in Nature to landmark clinical trials in the New England Journal of Medicine and cross-disciplinary collaborations in Science Translational Medicine, investigators throughout our institution have advanced new knowledge that is already transforming their diverse fields. In the 2017-2018 fiscal year, Feinberg principal investigators secured more than $484 million in sponsored research awards, a total that formed the majority of Northwestern University’s record-breaking year for research funding. In particular, Feinberg’s growth reflects a 13 percent increase in funding from the National Institutes of Health. In the final issue of Breakthroughs for 2018, we’re taking a look back at a few of the exciting research stories that marked the past year at Feinberg. 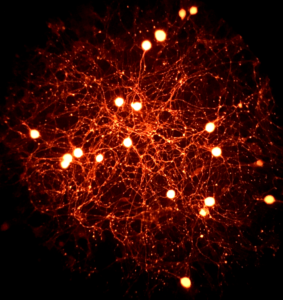 Northwestern Medicine scientists kicked off the year with a rare fundamental discovery about cell function, published in Nature. A team led by Dimitri Krainc, MD, PhD, the Aaron Montgomery Ward Professor and chair of the Ken and Ruth Davee Department of Neurology, discovered for the first time that two key cellular structures, mitochondria and lysosomes, come into direct contact with each other to regulate their respective functions. “It’s a surprising finding that provides new insights into normal cell function and will likely have implications for a number of diseases across the board,” Krainc said. Mark Huffman, MD, MPH, the Quentin D. Young Professor of Health Policy, associate professor of Preventive Medicine and of Medicine in the Division of Cardiology, was first author of a study that found a simple toolkit of checklists, education materials and feedback reporting improved the quality of care, but not outcomes of major cardiovascular events, in a group of 60 hospitals in south India. The findings were published in JAMA. 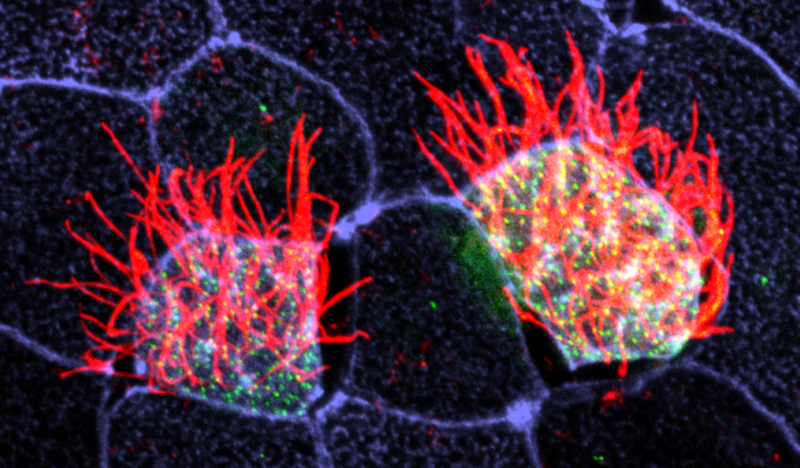 A team led by Brian Mitchell, PhD, associate professor of Cell and Molecular Biology, identified a protein called CLAMP to be crucial to planar cell polarity — a mechanism that organizes cells and allows some to perform specialized functions. The study, published in the Journal of Cell Biology, has important implications for the understanding of early development and certain diseases, including respiratory conditions. 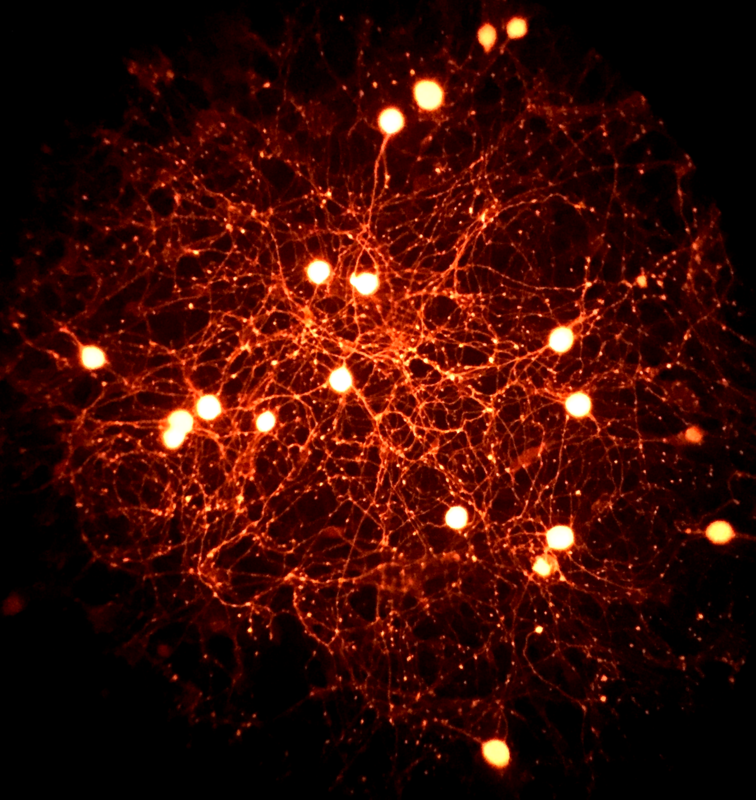 In vitro cultured nociceptive neurons genetically labeled in red and ready for analysis of their intracellular calcium concentration using Fura-2 in vitro calcium imaging. From research published in April by Daniela Menichella, MD, PhD. Painful diabetic neuropathy (PDN) is an incurable nerve disease that affects about one-quarter of all patients with diabetes. Daniela Menichella, MD, PhD, assistant professor of Neurology in the Division of Neuromuscular Disorders, demonstrated that blocking a molecule called CXCR4 reversed pain and nerve degeneration in laboratory models of PDN. The discovery, published in the Journal of Clinical Investigation, may lead to the first ever disease-modifying therapy for patients with PDN. The laboratory of Ali Shilatifard, PhD, chair of Biochemistry and Molecular Genetics and director of the Simpson Querrey Center for Epigenetics, delivered a remarkable number of high-impact discoveries this year, including a paper published in Nature Medicine. The study identified an epigenetic imbalance that silences the expression of tumor-suppressing proteins, allowing cancerous cells to proliferate. The scientists further demonstrated that a molecular inhibitor reverses the imbalance and inhibits tumor growth in a lab model. “This is a simple molecular concept with major clinical significance,” Shilatifard said. Maha Hussain, MD, the Genevieve Teuton Professor of Medicine and deputy director of the Robert H. Lurie Comprehensive Cancer Center of Northwestern University, was the senior author of a large clinical trial that may lead to a new treatment option for men with aggressive prostate cancer. The findings, published in the New England Journal of Medicine, showed that an existing drug called enzalutamide significantly lowered the risk of metastasis or death for men with non-metastatic castrate-resistant prostate cancer and a rising PSA level. Laws that ban smoking at workplaces and other public places are associated with a significantly lower risk of cardiovascular disease — even after controlling for a variety of factors — found Kiarri Kershaw, PhD, MPH, assistant professor of Preventive Medicine in the Division of Epidemiology, in a study published in Circulation. Smoke-free policies in workplaces were associated with a nearly 50 percent reduction in risk among middle-aged adults, while policies for bars and restaurants were linked to a reduction of around 25 percent. For many years, obstetricians counseled women that inducing labor increased the likelihood of a cesarean birth. But findings from a large national study led by William Grobman, MD, MBA, the Arthur Hale Curtis, MD, Professor of Obstetrics and Gynecology, reversed that commonly-held belief: The clinical trial showed that electively inducing labor at 39 weeks actually reduces the rate of cesarean deliveries and decreases maternal and fetal complications. The findings were published in the New England Journal of Medicine. The first simple blood test to identify a person’s precise internal time clock as compared to the external time was developed by a team of Northwestern Medicine scientists, including Rosemary Braun, PhD, MPH, assistant professor of Preventive Medicine in the Division of Biostatistics, and Phyllis Zee, MD, PhD, chief of Sleep Medicine in the Ken & Ruth Davee Department of Neurology. The new test, described in the journal PNAS, will for the first time offer scientists the opportunity to easily examine the impact of misaligned circadian clocks in a range of diseases, from heart disease to diabetes and Alzheimer’s disease. Minoli Perera, PharmD, PhD, associate professor of Pharmacology, was senior author of a study that found a group of gene mutations seen only in African-Americans and people of African ancestry may contribute to an increased risk of serious bleeding while taking warfarin, a common anticoagulant drug. “These mutations could be included in the risk-benefit calculations every physician makes with a patient,” Perera said. The research was published in JAMA. A collaboration between clinicians and biomedical engineers led to the development of a new wireless, Band-Aid-like sensor that could revolutionize the way patients manage hydrocephalus — a potentially life-threatening condition in which excess fluid builds up in the brain. John Rogers, PhD, professor of Neurological Surgery and at the McCormick School of Engineering, and Matthew Potts, MD, assistant professor of Neurological Surgery, were co-senior authors of the study published in Science Translational Medicine. “It’s a wearable device with a specific but useful mode of operation that’s addressing an unmet need in clinical medicine,” Rogers said. Check out the Feinberg News Center to follow new research stories throughout December.